Do NOT share with anybody. This is just so you an see all the work and measurements. The announcement has typos and is missing stuff. Tomorrow I will have the correct info. I will also send you a spreadsheet with measurements. 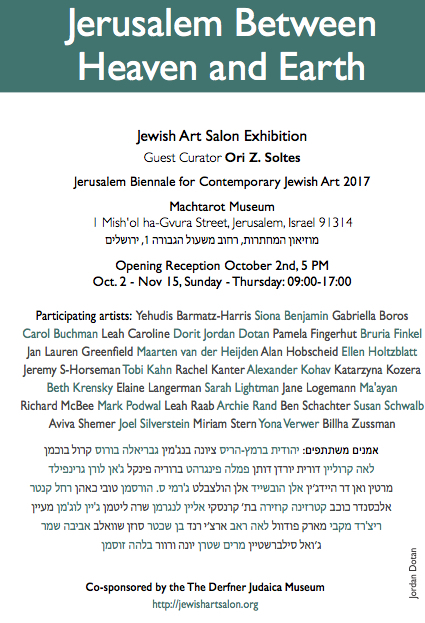 The Jewish Art Salon has been selected to exhibit at the 3rd Jerusalem Biennale for Contemporary Jewish Art, which will showcase the work of nearly 200 professional artists in dozens of exhibitions and installations. 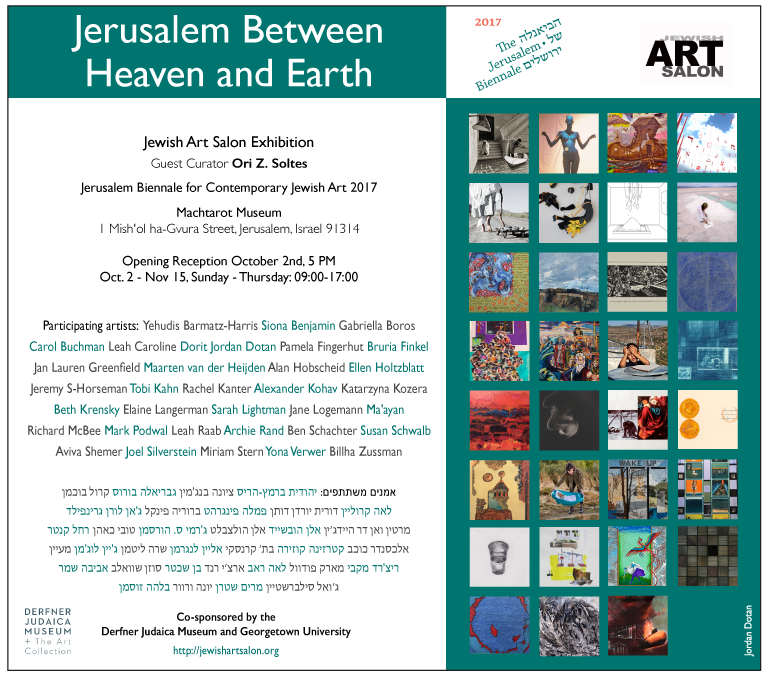 The Jewish Art Salon’s entry “Jerusalem Between Heaven and Earth” was curated by Ori Z. Soltes, and will be on view from October 1 – November 15, 2017. The exhibition features work by Salon members from the USA, Europe and Israel, and is co-sponsored by the Derfner Museum and Georgetown University. Co-sponsored by the Derfner Museum, Riverdale, NY, and Georgetown University, Washington DC. The outcome of this series of divergences for the multi-valent city’s place in and between worlds is four-fold. One, within the Jewish tradition, the biblical has given way to the rabbinic and its penchant for midrash—encountered through Rachel Kanter’s fiber, “Wake Up,” and Beth Krensky’s video, Tashlich. Ben Shachter’s “Aquavit: Praying for Rain” furthers the rabbinic by re-visioning the concept of the mikveh. The rabbinic has in turn ramified toward the mystical, as in Susan Schwalb’s small, tight abstract visualization of the concept, Lamed-Vav, and Alex Shalom Kohav’s installation, “A/Dam,” that interrogates the relationship between humans and the divine, of which Jerusalem has been an enduring symbol. In Carol Buchman’s haunting work the mystical and geological become panentheistic: the Name of God suffuses nature at its most extreme; the artist functions as priestly intermediator. Three: Jerusalem reaches and branches into Islam and Christianity—converging with and diverging from the city’s Jewish emphases. Siona Benjamin’s painting considers how PaRDeS (as a Jewish, and particularly a Jewish mystical concept) intersects the Islamic concept of Jannat. Miriam Stern re-visions the lushly colored Christian vision explored in the Crusader Bible. Four: the watershed of Jerusalem turns inward: Sarah Lightman and Ma’ayan both turn the topography of Jerusalem toward profound life watersheds regarding people and the very making of art. Bruria Finkel’s “Salt Mound” installation turns the issue of potable and salt water convergences back toward the geology of Jerusalem. Yehudis Barmatz-Harris’ video turns water to fire in pushing history backwards: from the crucible of Jerusalem’s return to Jewish hands through the Shoah and the connotations of fire in Hassidic mystical thought to the book-burnings of diaspora experience and the burning of the Second and First Temples to the purification process of the Israelites in the wilderness by means of the burning of the Red Heifer. Pamela Fingerhut’s digital image of Miriam and Baby Moses returns us to the biblical moment of Moses’ birth through a modern Middle Eastern lens.